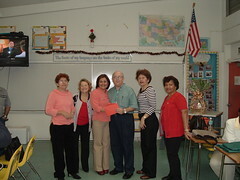 I taught Adult Education classes and worked as a coordinator of programs at Adult Education and Community Schools in the Miami area and in Naples from 1975 to 2005. 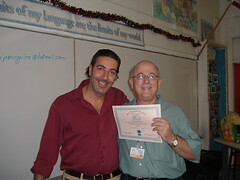 My favorite school of all was the English Center In Miami, Florida. You know the saying, "when life gives you lemons, make lemonade?" Well that's exactly what they do at the English Center. The English Center (TEC) is a full service Adult Education Center. The school is located in a 1950's era former elementary school and operates seven days a week offering day and evening classes. The old building hasn't seen much renovation since 1950, and still has the plumbing fixtures at heights appropriate for five year olds. At times, I observed that if you stood in one place long enough in the deteriorating classrooms, the millions of ants would carry you away! Classes would occasionally be interrupted by visits from brazen mice scurrying through the classrooms. Those things do not stop the dedicated staff from offering a full array of Vocational, Basic Education and General Education classes. In all the time I spent at the English Center, I never considered one minute to be "work." The motivation and desire of the students made every moment there an educator's dream. TEC students come from all over the world. From former doctors fleeing civil war in Peru, Colombia or Central America to indigenous people from South and Central America for whom Spanish was a second language and English a third language, the variety of student backgrounds was amazing. Here are some pictures from an end of term "fiesta" for one of my classes at the English Center. The second photo is of a student who was born in Italy, emigrated to Argentina as a child and then came the United States. English is now his third language.